Other editing icons for images include rotating counter-clockwise and clockwise, flipping vertically and horizontally, undo and redo. You may rotate an image, either counter-clockwise or clockwise, with the help of the second and the third icon from the left of the editing image toolbar. And you may flip an image, either vertically or horizontally, with the help of the fourth and fifth icon from the left of the editing image toolbar. While the two other icons left were helpful, if you wish to undo or redo an editing action that you have just made. 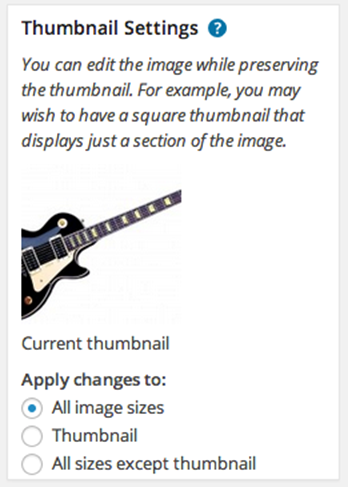 Thumbnail Settings gives you an option on where do you want to apply the changes you made with the image. When done editing, you may hit Save and Update Media, to save the changes you have done.